Video testimonial 1 from Janice Corsano on Vimeo. Video testimonial 2 from Janice Corsano on Vimeo. Video testimonial 3 from Janice Corsano on Vimeo. "I had spent 15 years "on my path," before beginning work with Janice. Regardless of all this "work" completed, I still was frustrated and unfulfilled in my day-to-day life. I had done and learned much - completed the 2-year program Priestess Path Apprenticeship; attended shadow work weekends where I uncovered and expressed (released) deep anger and resentments; joined various spiritual communities to find my way to peace (The Art of Living, The Center of Light, A Course in Miracles), became Reiki II attuned learning the realities of energetics of Barbra Brennan School of Healing, the school of Crystal Light Healing, and extensive cranial sacral work to release trauma. I traveled the world (France, South Africa, Australia) attending shamanic/indigenous retreats and partaking in ceremony and several different modalities of healing with them. Through all this work and travels, I still struggled with feeling happy and fulfilled in my day-to-day life. It is Janice who unravels "the code" of human behavior that is keeping the carrot just out of reach. I find that Janice is the person with "boots on the ground." She reveals to us our hidden core beliefs that "run our lives" while they remain outside of our awareness. She corrects our erroneous thinking (hidden negative core beliefs) that leave us frustrated and unfulfilled even though we "know the way." Since working with with Janice over the past 2 1/2 years, I am the happiest and most fulfilled I've ever been. I have confidence and a belief that I deserve and can attain the the good things in life - love, respect, intimacy, trust, abundance, and I am, in fact, experiencing all these things. Thank you sooo much Janice Corsano!!" "My name is Margaret and I am a 49 year old working, divorced, mother of two. Prior to coming to Janice, I felt as though my life was coming unraveled. After keeping it together for so long with being the boss, volunteering, being a mother, friend, daughter. I couldn't do it anymore. I was on the hamster wheel running faster, faster, faster, about to fall off when a friend introduced me to Janice. After meeting with Janice and listening to her relaxation CD's and following a few simple steps; my life has changed. I feel more relaxed, I'm sleeping better. I am also a better boss and mother with more patience. A better friend and daughter with more compassion. Janice is giving me the tools to deal with the hectic, chaotic world we live in. Thank you Janice." "I have worked with Janice Corsano for several months and it has been an amazing experience. To me, she is a gifted and intuitive life coach. Janice is showing me how to enjoy a full and successful life, filled with joy. Over the years, I have made great progress through individual therapy as well as group therapy. I feel that seeing Janice is the next step in fine tuning my life experiences. Janice has a gift for zeroing in on what's really going on and has shown me how to use my own tools to handle day to day situations as well as hard life choices." "Hi Janice - THANK YOU - THANK YOU - THANK YOU!!! God truly has blessed me with finding you and I have no doubt he put you in my path for a reason. I can't tell you enough how much our last reading has meant to me. I think it healed me forever. The following day, I think was the first time I felt unburdened and felt true "joy" again. Our time together somehow lifted something off of me - perhaps it shook off that last bit of doubt I may have been clinging on to. Each day, I think about the things my father and mother said when they came through and I realize, after the fact, that what they said was exactly what my family needed to hear. In other words, it may have seemed trivial at the reading, but in hindsight, there were important messages planned. Some more important to one of my sisters than me. Overall I just feel happier." "Before I began my work with Janice, I could see my future before me and nothing was what I wanted. I saw a life that had no purpose, no drive, no real emotion, and most importantly no real connection to anything greater. In this future, I was just a piece of meat being dragged by the seemingly all powerful forces around me. I could see myself wanting more control within my life, more fulfillment and a sense of contentment. I wanted something that I could never find. I would push and struggle to fill that hole with anything that might take away the self-loathing, if only for a while. In the end, however, I would succumb to the inevitability of my failure and do what I was always conditioned to do. Turn away. Thankfully working with Janice has given me the freedom to change my future into something I am happy with. She has turned my life view from one of inevitable loss and disappointment to a world that is exciting and challenging, but in no way daunting. Every day I wake up excited for what I will learn, what I will create, and how all things come together." "I want to take this moment to thank Janice Corsano for guiding and helping me to "be." Words cannot even explain the transformation that I and others have seen in me. I ran into a friend last week who said, "You are glowing!" Believe me, it is not from a facial. I feel like I have had a total body makeover from the inside out. How? Stripping away old beliefs, roles, labels, and thought patterns has enable my spirit to shine through. I am more aware and free than I have ever been. I used to worry about my future career and love relationships and experience a tumultuous assortment of feelings such as loneliness, self pity, guilt, and concern of what other people thought of me. On some level I may still have some of these feelings because I am a human being, but there is a difference. The difference is that it doesn't cripple me anymore! I can honestly say I am at peace. I do not identify with or give into the pain anymore. I have come to realize that buying into old programs leads to pain and numbs me from experiencing the moment and those moments add up into days, weeks, months and maybe even years. Janice has made it very simple and easy to identify that which is keeping me from connecting to my true self and spirit guides. I see the world through new eyes and have a deep belief and knowing that we are all ONE and connected. It is through this new way of viewing myself and others that I am able to REALLY experience all of life as a gift and blessing for us all. Janice is an angel and I am blessed to know her!" "After my father died suddenly and my mother had a heart attack 12 hours later. I was lost. My father was my hero and guide in life. Janice was able to tell me information that helped to heal my broken heart. She even had running jokes with my Father on the other side. She told me his thoughts, which will ring true in my heart forever. After 7 months passed, I was still numb. Janice told me my Dad said, "It was time to move on. He wanted me happy, and to let go of the extreme sadness I felt." I knew it was my Dad, as he was losing patience with my mourning. He wanted nothing more for me than to be happy. 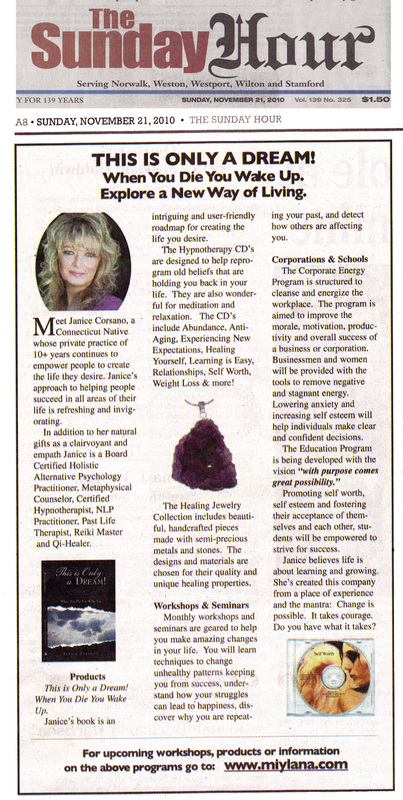 Janice's gentle and loving guidance helped me to move forward and start to participate in life again. It inspired me to live my dream, to move, live near the water and forever keep him close. My life is much different without my Dad, as his death was never in my realm of thought....too unbearable to imagine! But, with Janice, I was able to communicate with him again and appreciate his humor after he passed. If not for Janice, I don't know where I would be today....maybe still in bed asleep....Thank god for her divine intervention for me and my family." "I first met Janice 5 years ago when my wife told me about a lady who was able to communicate with the Angels. Janice turned out to be so much more. I went to her looking for guidance over business and personal issues and cannot express how helpful she has been in my life. As a matter of fact, both my daughters, brother, wife and numerous friends have since been guided by her. Janice is a spiritual healer, hypnotherapist, family therapist, and personal guide of the highest order. She has helped my family on numerous occasions. We recently bought a new house and moved to another state. During the process we consulted Janice, looking for confirmation and guidance on such a huge endeavor. It amazed us how accurate her predictions have been. She encouraged us and suggested ways to prepare for the move that gave us the confidence needed to proceed. The results have been amazing and our family couldn't be happier. I can honestly say that no matter what the situation, Janice is the first person I would call for advice and counsel. She is truly a spirit guide who is in touch with her higher power and who does not hesitate to help others whenever and wherever she can. If I could choose my Spirit Guide, it would be Janice so that she could be with me always."